There were larger purses due to an increase in the number of sponsors. Competitors would be using a new spec tire from Toyo. Race weekends included two standing start races (limited to fifty-minutes) – one for the Grand Touring class and another for the Touring Cars. Grand Touring (GT) – The GT class rules accommodate an extensive range of vehicles from different manufacturers. There is no limit to the engine displacement in this category and cars may use a forced induction system. To stop the cars, alternative materials may be utilized for the brake pads and shoes. Rules also allow the use of four-piston calipers but rotors are limited to 14-inches in diameter. The maximum diameter of the wheels is 18-inches and any changes to the bodywork must be approved. The series uses a spec tire and competitors race on Toyo Proxes RA-1s. There were eight-race weekends during the 2001 season. The opening rounds were in March at Texas Motor Speedway and Sebring, Florida. Teams weren’t back in action until May at Mosport International Raceway and Lime Rock Park. Lime Rock would be a doubleheader for the Touring Cars. The next event would be at Detroit’s Belle Isle which was just for the Grand Touring category. The championship would move to the west coast with races at Sears Point Raceway, Portland International Raceway and Mazda Raceway Laguna Seca. The final weekend was at Road Atlanta. The schedule initially included a round at Charlotte Motor Speedway but when that venue was cancelled Road Atlanta became a doubleheader weekend. Round two was at Sebring International Racing as part of the 12 Hours of Sebring weekend. Twenty-eight World Challenge Touring cars would compete in a 50-minute race around the 3.74-mile seventeen-turn road course. 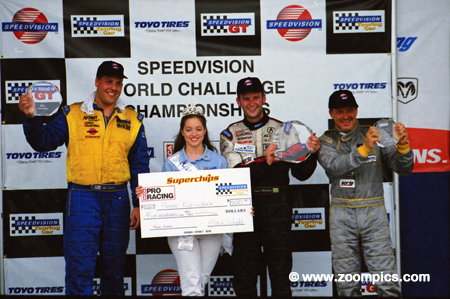 2000 World Challenge Touring Car Champion Pierre Kleinubing just missed making the podium at the season opener in Texas. But at Sebring, he redeemed himself by capturing the pole and victory. 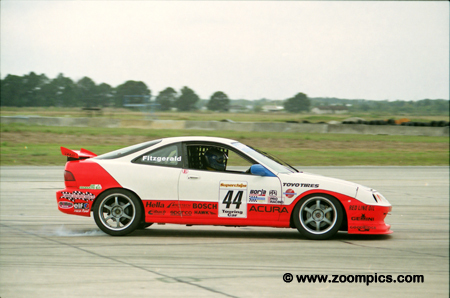 The Acura Integra Type R driver dropped behind Will Turner at the start but was able to pass him on the tenth lap. This was Kleinubing’s eleventh win in five years of World Challenge competition. 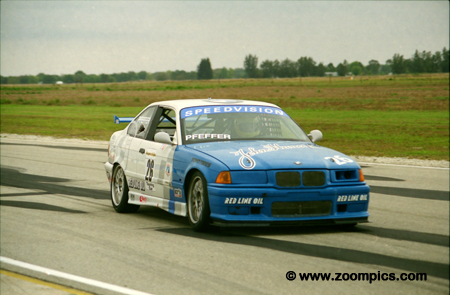 DuPont Motorsports entered two BMW 328is – one for team Principal Alfred duPont and another for 2000 'Rookie of the Year' Neal Sapp. The two opened the season with podium finishes – second for Sapp and duPont in third. At Sebring Sapp qualified the No. 55 BMW fourth. Unfortunately, he retired after fifteen laps with engine problems. Will Turner made a great start from second place and led nine of the seventeen laps. The BMW 328is driver hounded eventual race leader Pierre Kleinubing until the end but could not retake the first position and finished just 0.815-seconds behind Kleinubing. Steve Pfeffer drove the McMillin Motorsports BMW 328is to a convincing win over pole-sitter Neal Sapp at the season opening race at Texas Motor Speedway. 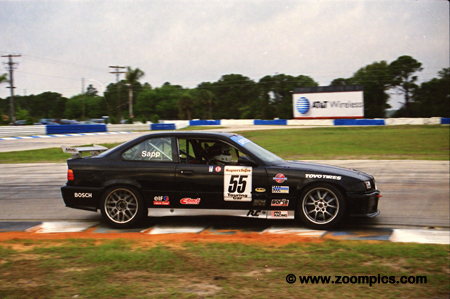 At Sebring he was again battling with Sapp until the duPont Motorsports driver encountered engine problems. With the retirement of Sapp, he was able to cruise to a third place finish and maintain the points lead in the Drivers’ Championship. 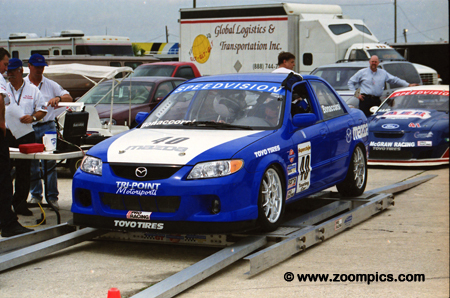 TriPoint Engineering entered two Mazda Proteges at Sebring. Shauna Marinus qualified twenty-third and finished twentieth. The No. 40 entry driven by Paul Bonaccorsi fared slightly better earning a fourteenth place finish after starting sixteenth. 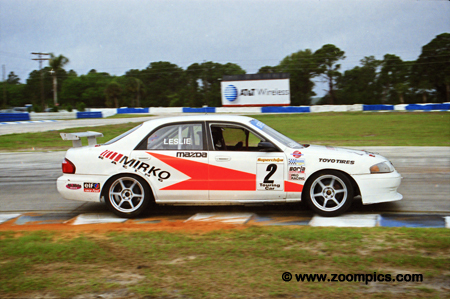 In 2001, Mirko Racing entered a Mazda 626 for British Touring Car veteran David Leslie. The Scotsman had competed for thirteen seasons scoring nine wins before leaving the British series to join the World Challenge championship. 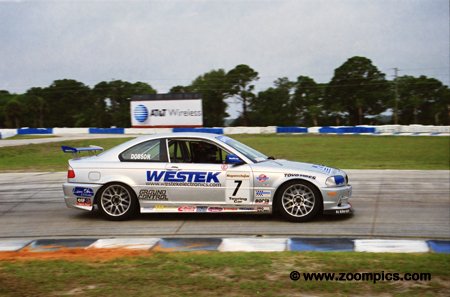 At Sebring, he started and finished seventh. 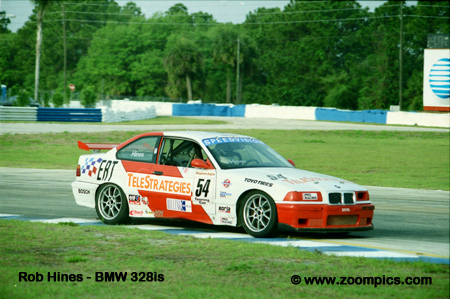 For his drive, Leslie earned the Borla Performance Award after a race long battle with the BMW of Terry McCarthy. Drew Hagestad qualified fifteenth in his Volkswagen Jetta. Problems during the race relegated him to a twenty-first finish - the first car a lap down to the leader. Mike Fitzgerald was part of the five-car effort entered by the RealTime Racing Team. 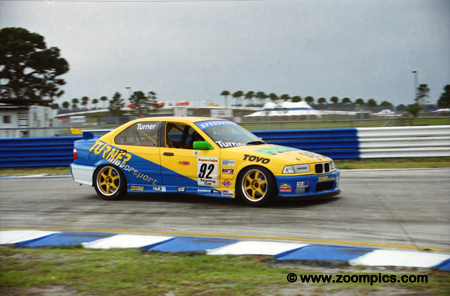 He had contested the 2000 season in a TC Kline prepared BMW. Here he locks up the rear brakes entering Sunset Bend. 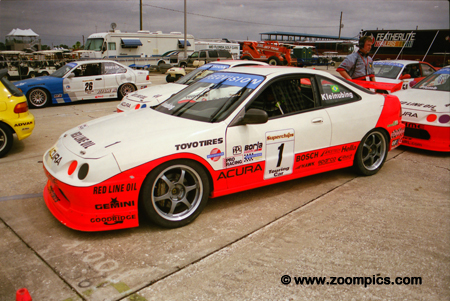 Fitzgerald qualified fourteenth and finished ninth in the Acura Integra Type R.
In 2001, Ken Dobson replaced his quick Pontiac Sunfire GT with a new BMW 328Ci. 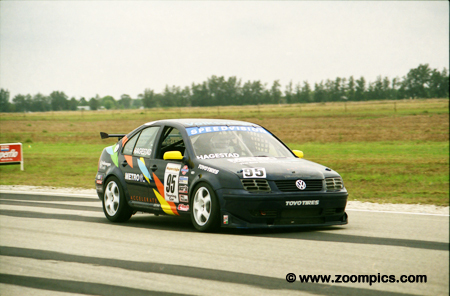 At Sebring, he qualified eighteenth and finished thirteenth. The World Challenge Touring Car podium at Sebring. On the left is second place finisher Will Turner and at the right Steve Pfeffer who captured third. Between these two is the winner Pierre Kleinubing. The weekend was a World Challenge 'clean-sweep' for RealTime Racing as Peter Cunningham won the GT category.